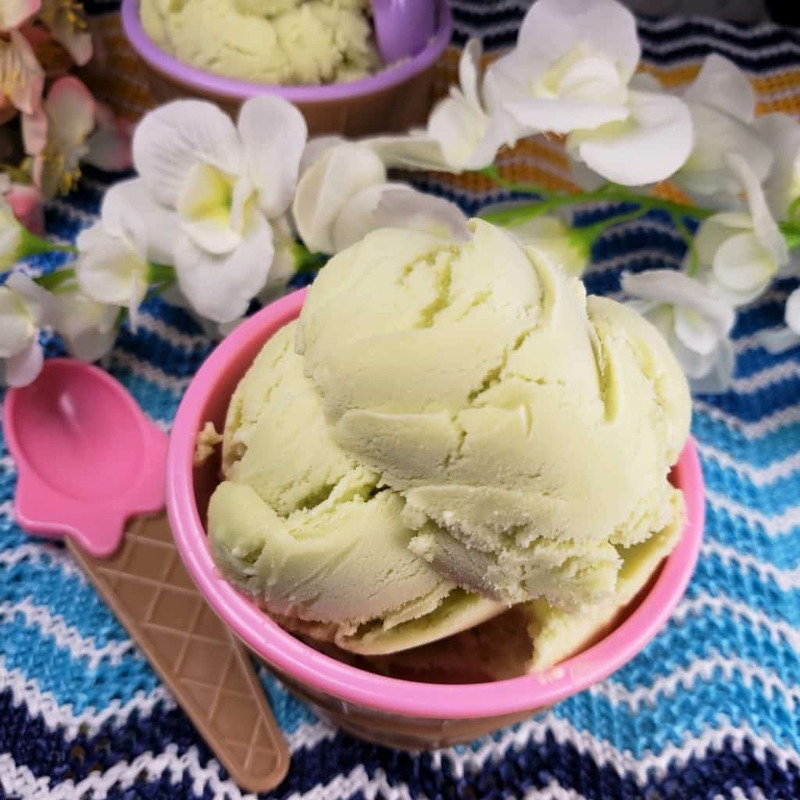 California has some of the best avocado growers in the world, so what better way to kick of summer, than with my Homemade Avocado Ice Cream recipe? It is SUMMER!!!! This means lots and lots and lots of ice cream. Ha, no really, it’s a time to have fun, hang out in the sun, swim, bike ride and more. There is nothing better than a bowl of ice cream or an ice cream cone to round out your day. I will be doing a serious of lots of delicious flavors of ice cream, so make sure to check back often. Another refreshing summer recipe is my Watermelon Lemonade. The flesh of Haas Avocados are the creamiest out of all the varieties. For this reason, only a small amount of cream is used in my Homemade Avocado Ice Cream Recipe. 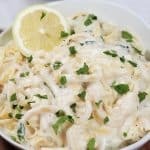 If you wanted to use all milk, you will still end up with a nice and creamy consistency. What are the Ingredients for Homemade Avocado Ice Cream? Is an Avocado a Vegetable or a Fruit? Avocado is considered a fruit. Similar to a banana, the avocado matures on the tree, but it ripens after it is picked. There is one large seed in the middle of the pear shaped fruit. Some people call the seed a pit. I don’t much think it matters what it is called. There is an easy trick to removing the seed or pit, whichever you prefer to call it from the avocado. How to Remove the Seed of the Avocado. 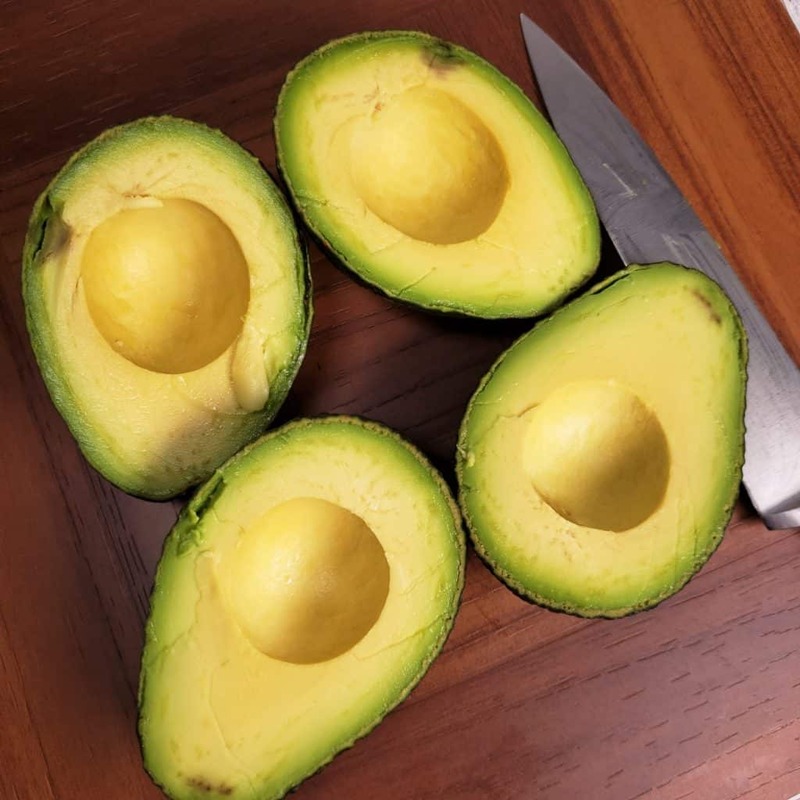 Use a good sharp knife to cut the avocados in half, being careful not to cut all the way through. With a slight force lunge the sharp blade of the knife into the seed and twist. Lift the handle of the knife and the seed will pop right out. 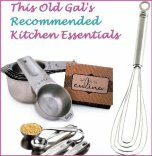 A Vitamix or a blender will blend the ingredients up really well. 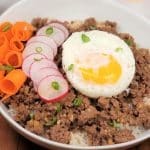 Be careful not to get carried away with the blending as your ingredients may get too warm. If that is the case, place the blended mix into the refrigerator for a while to chill. After blending in the sugar, give the mix a quick taste to determine if you need more. I usually start with less than I think I need, just in case. 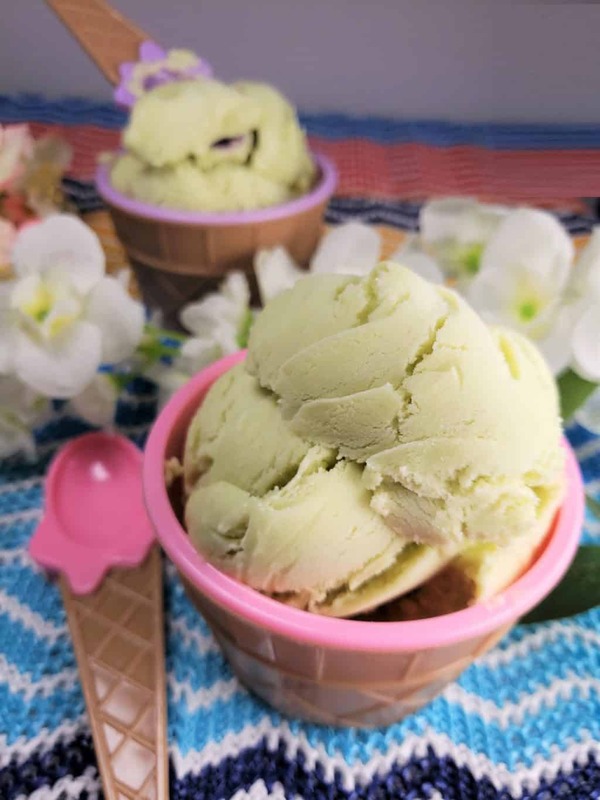 With this Homemade Avocado Ice Cream Recipe, it will make a difference. 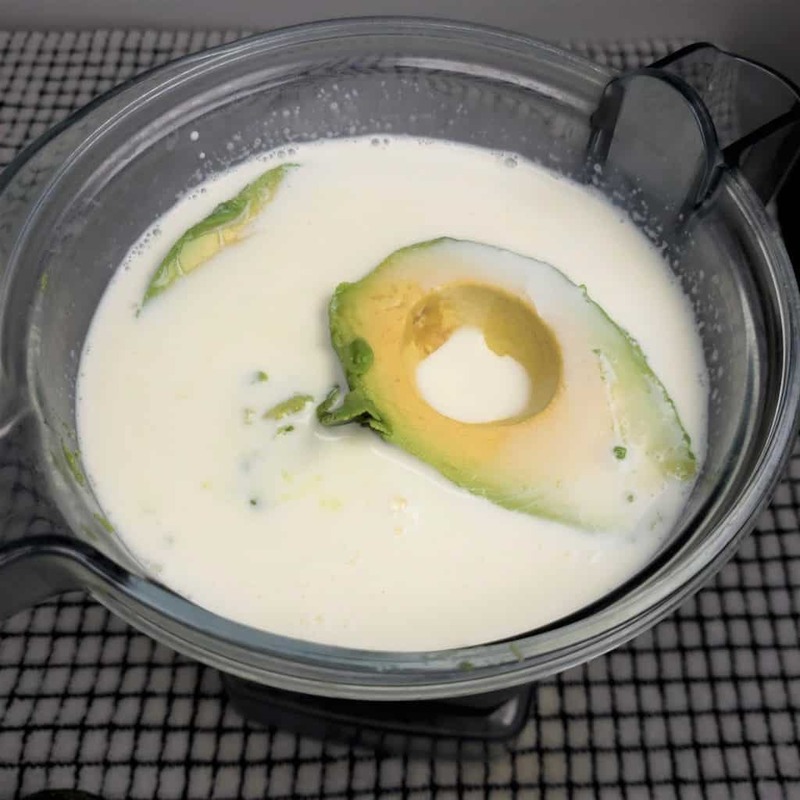 If the avocado is not ripe enough you might want to add more sugar. Or perhaps you prefer a less sweet taste. This may sound weird, but, fresh lime juice totally takes the flavor up another notch. 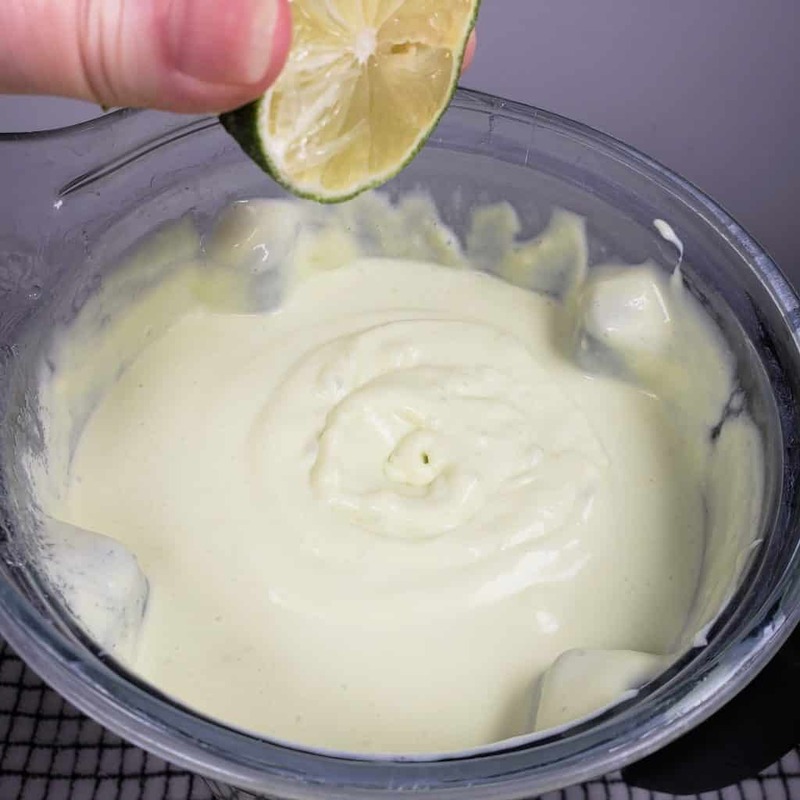 I love it so much and I have been known to take a fresh lime and squeeze it right over my bowl of Homemade Avocado Ice Cream. 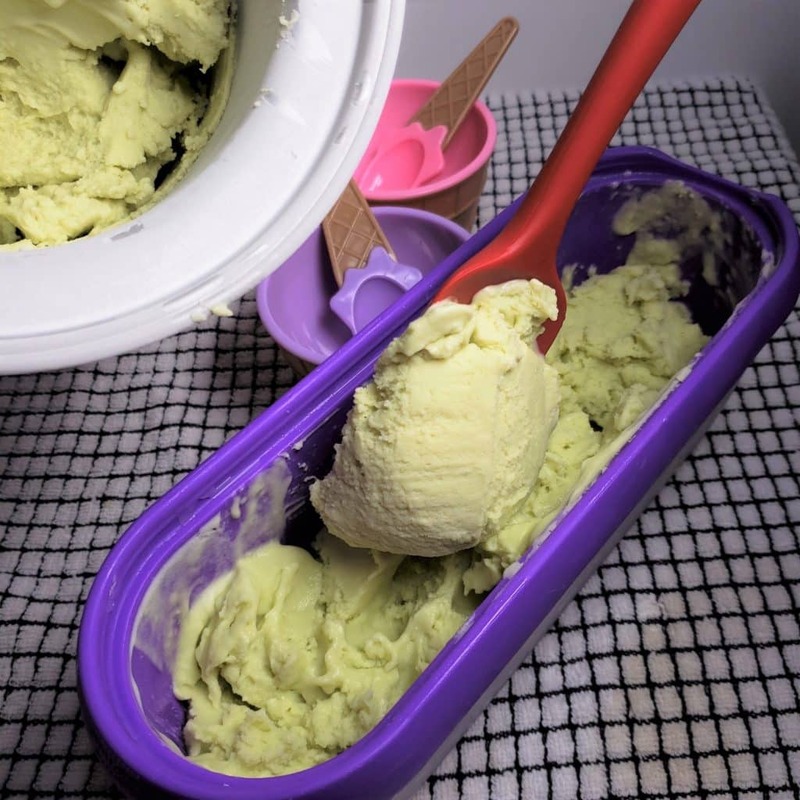 For this Homemade Avocado Ice Cream Recipe, I am using my Cuisnart 2 Quart Ice Cream Maker. Per the instructions, you need to put the inner container in the freeze over night. It seems to work better if the container has a full two days to freeze. I suggest leaving the container in the freezer between making ice cream. Or, you can be piggy like me and buy an extra container, so that you can do a second flavor right after the first. Actually, I love Coconut Ice Cream (recipe coming soon), Strawberry and Avocado. Ed only likes Vanilla, so, you know…gotta take care of the man. There is simple an On and Off button on this model, so just turn it to on. The time is about 25 minutes. When the ice cream machine stops, the ice cream will be slightly soft and need to harden up in the freezer. The design of the containers is nice because, not only is it narrow to easily fit on the door of your freeze, but it is long, so that you can get a nice long scoop, all in one shot. Okay, so I am dork. I like cutsie tchotchkes. These Ice Cream Bowls just called my name. At slightly over a dollar each (delivered! ), I could not resist. The insulated container will keep the ice cream hard while you are serving. The rubber bottom keeps it on the counter right where you put it, without sliding! Another gadget, yes. I actually purchased several ice cream scoops. 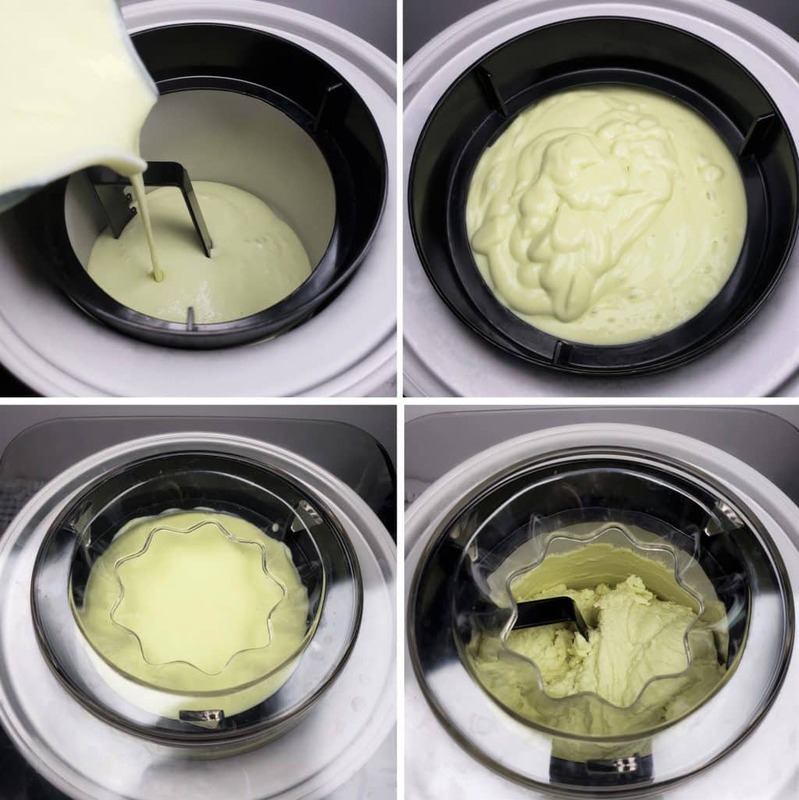 Even the expensive scoop that has the liquid center. You are supposed to warm the scoop and it is supposed to make scooping hard ice cream easy. Not! At $25 bucks a pop and I bought two, one for home and one for the RV, I wasn’t happy. 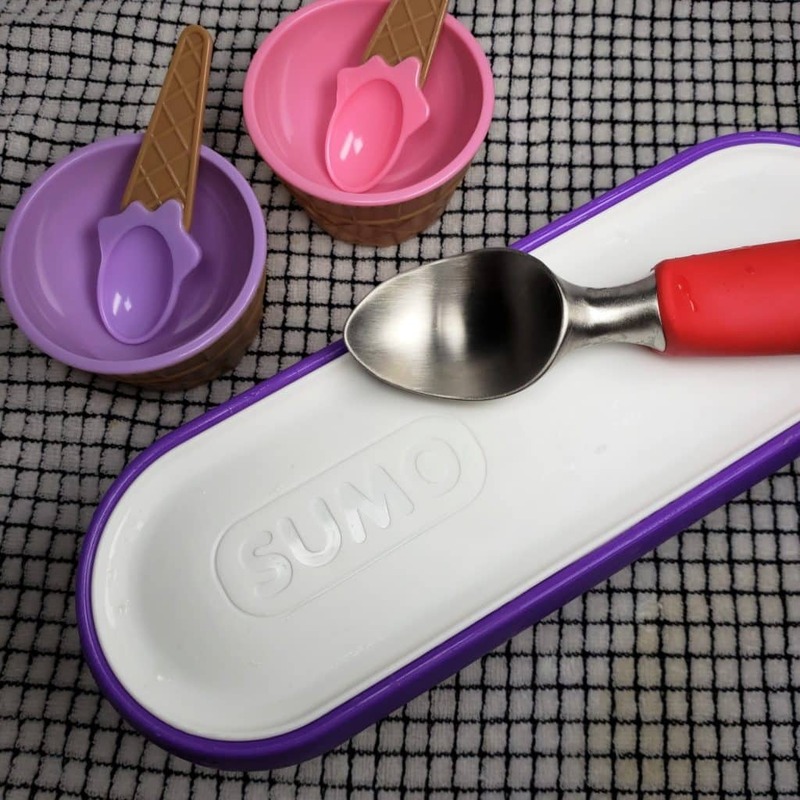 So, when I saw this Sumo Ice Cream Scoop with all the great reviews, I was skeptical. I am here to tell you that it slides right through. Easily, right through, like cutting semi hard butter. 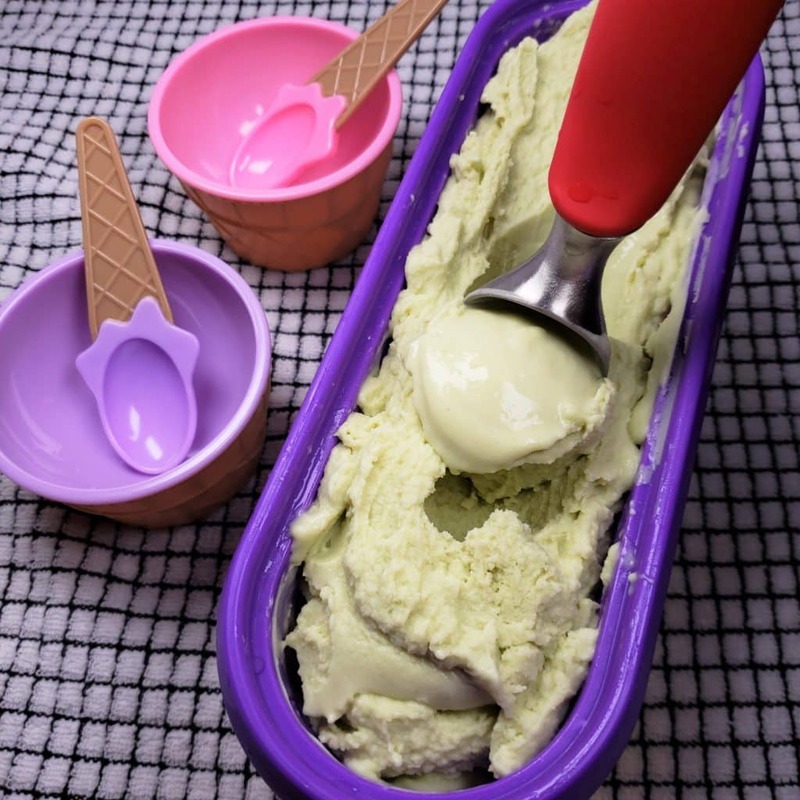 With very little work, you can make your very own Homemade Avocado Ice Cream. 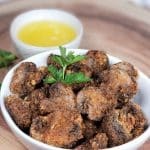 Want Some more Avocado Recipes? 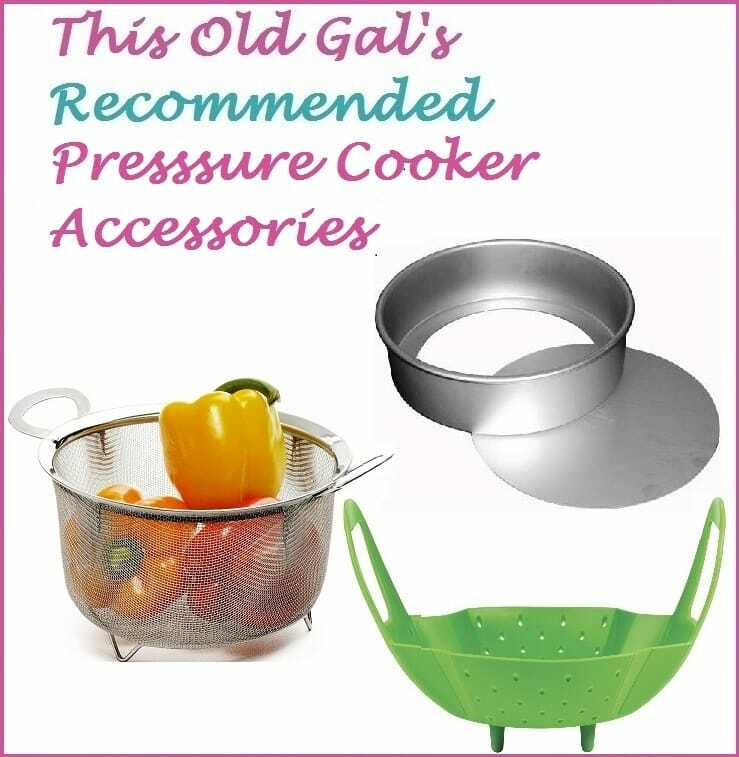 Tag me on Instagram at #thisoldgacooks and show me your photos! 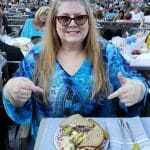 I love to see photos. Freeze the internal cylinder of your ice cream maker for several days, or if you are using an ice cream maker with a compressor, you might want to halve the recipe. 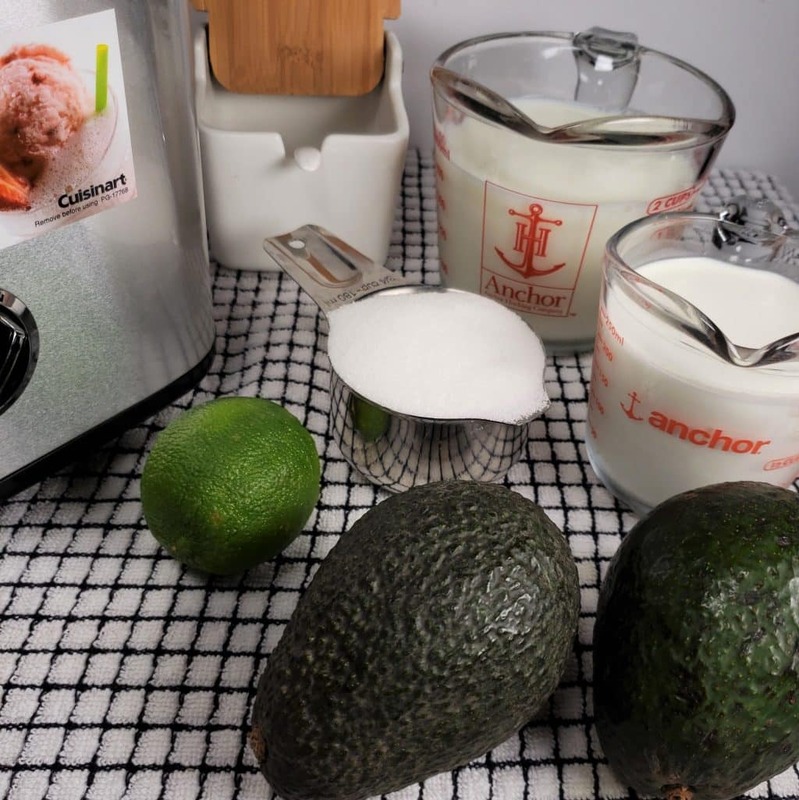 Remove flesh from avocados and place them into food processor or Vitamix. 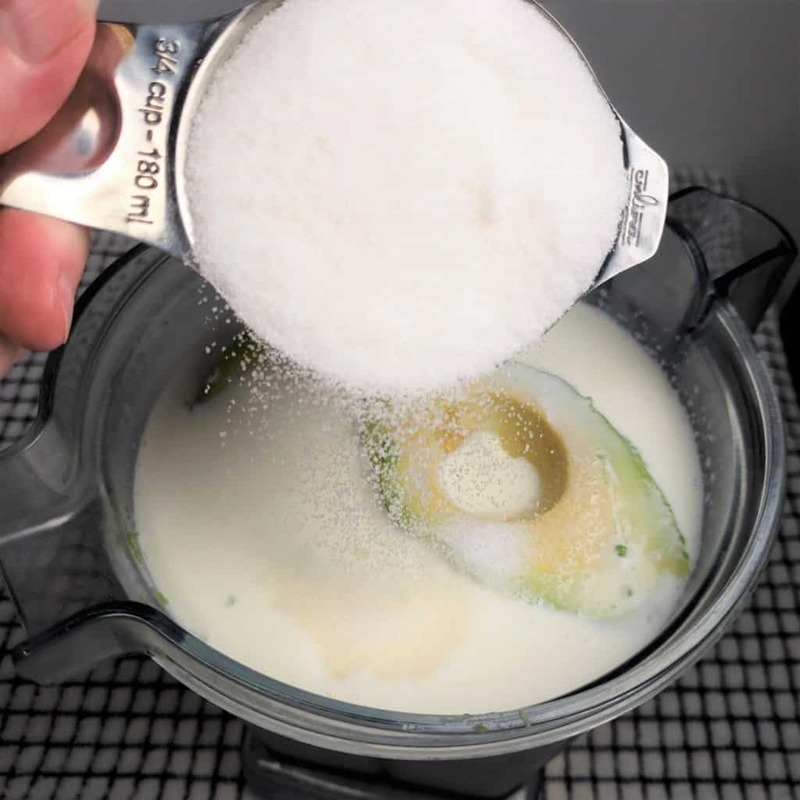 Add milk, cream sugar, lime juice and salt and process until smooth. 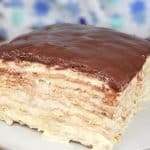 Taste and if more sugar is desired, add a little at a time. Pour into ice cream maker and turn on, per manufactures instructions, around 25 minutes. When ice cream machine stops, or ice cream machine starts to strain, turn off machine and scoop ice cream into a container. Place container of ice cream in freezer overnight, or until desired firmness. 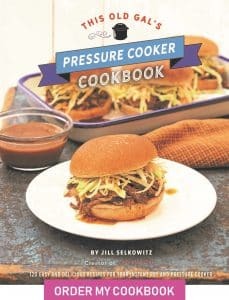 I just CANT wait to try this and I’m super excited to see the upcoming coconut ice cream recipe! I like doing a No sugar ice cream how much Stevia do I take. I will try few drops.